Recently published by Little Island this is the compelling sequel to the award winning Taking Flight. It continues Declan story. We are about two years down the road now, Declan has finished and passed his equine collage course and still working for Cam, his Mum is clean and trying to make amends for the past, he is staring to fulfill his dream and competing with Flight as Vicky has lost her nerve and is in a steady relationship with Seaneen, whom we met briefly in Taking Flight. Life is defiantly on the up for Declan but, such is life, complications are just around the corner. Flight being sold sets this ball in motion and despite his attachment to Seaneen, without Flight, Declan decides there is nothing keeping him here any longer. A dream job with a top show jumper in Germany is on offer and Declan has nothing to loose. That's when Seaneen drops bombshell no 1. Bombshell no 2 is when Declan finds 3 abandoned horses in an old disused barn, a place that will come back to haunt him, on his way home one night, a rather grizzly find as only 2 are alive and barely at that! These two events are enough to keep Declan firmly grounded in Ireland, his dreams now in tatters, however hard he tries to pretend at least one of these things isn't happening to him. The two surviving horses are taken to a local sanctuary and Declan, with encouragement from Seaneen, enquires about rehoming the foal. He's devastated to learn it didn't make it and can't help but wonder if he had found them sooner would it have been different. Unperturbed he makes the decision to take on the other 'ghost' horse instead. This mare is difficult, to say the least, and has has unsurprisingly lost all faith in humans. Not exactly the show jumper Declan was hoping for! Running parallel to Declan, Seaneen and the 'ghost' horses story is that of Cian. Cian is about 14 and the troubled son of one of Declans's mums new friends, Cians is a sad story of foster homes and alchol, drug and substance abuse. Declan doesn't want to but finds himself drawn towards the troubled youngster, who no doubt reminds him of his own past. It's Cian who provides Bombshell no 3, a truly horrific event that changes everything. It's a real coming of age for Declan and although I'm not really one for happy endings the ending to this book is bittersweet to say the least but happy and very fitting. As previously the characters are real, so very real, with proper depth and emotions and the horses are again integeral to the plot but this is not just a story for horse lovers. I particularly liked the parallel between Declan's troubled 'ghost' horse Folly and Cians story. Once again an absorbing and compelling page turner i didn't want to/couldn't put it down. Just fantastic, must be amongst the best contemporary fiction around. The author clearly knows/understands her subject (i believe she is a secondary school teacher) very well and isn't afraid to tackle these so so real issues, something she does with flair. BTW could you add a poll when you get the chance? Claire, i got mine on pre order (which was joke considering it came out on 1st and only arrived a couple of days ago!) from Book Depository. I just checked and they have it in stock but the price has gone up by a couple of quid! Thanks for adding the poll & the info haffy - wanted to get in on amazon as have a voucher! Thanks for the great review! My publishers are aware of the problem with Amazon and are doing all they can to sort it. In the meantime, why not order directly from them at www.littleisland.ie? People are telling me their copies of Grounded, which they had pre-ordered from Amazon, are being dispatched. It's still marked NOT IN STOCK, but that can't really be the case! We are still trying to sort it, but hope this is helpful in the meantime. Thanks for the update Sheena - looks like it may be an Amazon problem then. Have added the book to your webpage and put it up on the new books web page too, in case there are some people who dont know it's out yet. Be interested to know if the 2 books are available in shops. Unfortunately I live quite a way from a big town so I cant check the high street book shops to see whats on offer very often. Actually I'd be quite interested to know just what books are available in shops - may start a thread to do a little survey. Because it's an Irish publisher the book would tend not to be stocked in UK bookshops. However, you could certainly order it from your local bookshop without any difficulty. That is good because they often get in more than one copy, so spreading the word! Thanks for the webpage etc -- this is such a great site! Of all the praise that Taking Flight has had, the enthusiasm for it on this website has meant the most to me, because it's from real enthusiasts like myself. Thanks for your kind words re. the site Sheena. Nice to call us enthusiasts, I know some people would be more likely to call us bonkers ;D Its good to know the book can be ordered and is available in some places. I suppose what I was moaning about earlier was the fact that not so great pony books/pink fluffy pony books are always on display on bookshop shelves whereas the really good stuff is rarely seen and has to be ordered/bought from internet, etc. Too true! I am in the middle of my next one -- a 'proper' pony book this time and it is very un-pink! In fact my heroine is flummoxed by the pony girls at school whose attitude to their ponies seem to be a cross between My Little Pony and Girls' World. It's all about pink jodhpurs and sparkly whips. Needless to say our heroine at her no-nonsense yard will prevail! I do find the pink n sparkly pony books a bit odd having come from an era when most horsy girls were tomboys and looked askance at the clean frilly little girls going off to their dancing lessons! This book (and Taking Flight before it) were SUCH a wonderful breath of fresh air. 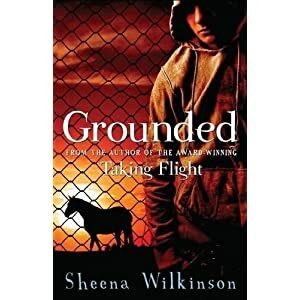 I was struck while reading "Grounded" that a few pages in, I had absolutely no idea where the story was heading - what a great revelation in a pony book! A couple of plot points nudged me that they were coming before they appeared in print - Cian in particular - but I think mostly because as a writer, I kept waiting for the moment of breakthrough, and when it failed to come, I started wondering why Cian was in the book if he wasn't going to be helped... Once he went missing, my spidey sense started tingling, and I was unsurprised by the next revelation, although it was still heartbreaking. I simply adored this book and along with Taking Flight, consider this to be exemplary YA fiction. I only hope I can write a book one day that is equally affecting!